Click on the "Configuration" cog-shaped icon. Note that this is not the same as the cog icon beside "Edit profile"
Click on "Machines/Methods", then "Add Machine/Method". Select a "Procedure" for the machine/method from the dropdown menu or by typing in the text box to search for a procedure. The procedure is the type of task that the machine/method (usually a piece of experimental apparatus or software) will perform e.g. an electron microscope 'Machine/Method' would perform the procedure 'Electron Microscopy', and a particular molecular dynamics web server 'Machine/Method' would perform the procedure 'Image Processing'. Select the procedure which best describes your machine/method. If no appropriate procedure exists please contact us. Or if you are an administrator see the guide Adding a new procedure for machines/methods. Type the name of the machine/method in the text box labelled "Name". The name should be unique and should allow this particular machine/method to be easily identified. Select the centre the machine/method is accessed from. If you are only connected to a single centre this should be filled automatically with your centre. Provide a short description of the machine/method for potential users. Using the "Remote Access:" checkbox, specify whether the machine/method is available for remote access. If selected, access users will be able to use the service without visiting the machine/method in person. 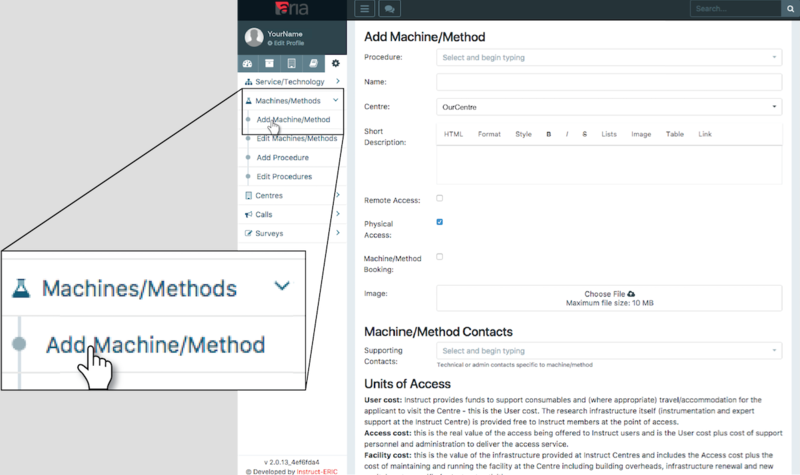 The pipeline for the remote access of the machine/method can be configured separately (see Configuring machine/method remote access). Using the "Physical Access:" checkbox, specify whether the machine/method is available for physical access visits. 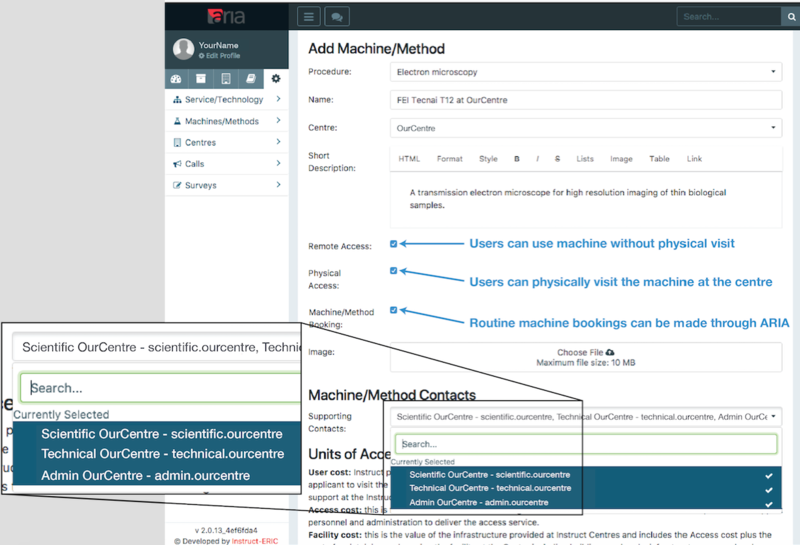 If selected, access users will be able to visit the machine/method at the centre in order to use it. 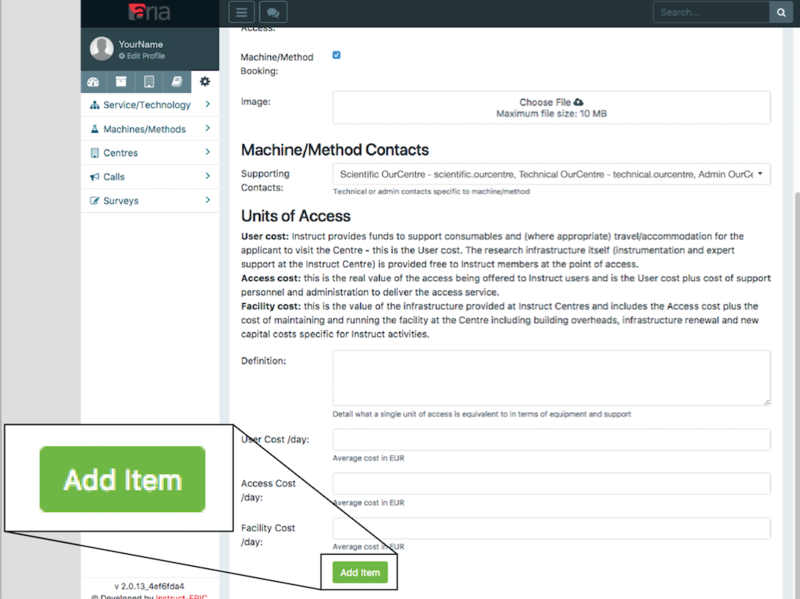 Using the "Machine/Method Booking:" checkbox, specify whether the machine/method will be available for routine bookings through ARIA (those not connected to proposals and applications from access users). The machine/method booking is separately configurable and can be linked to machine/method user training (see Configuring machine/method bookings and Managing user training status). Upload an image for your machine/method using the image upload box. 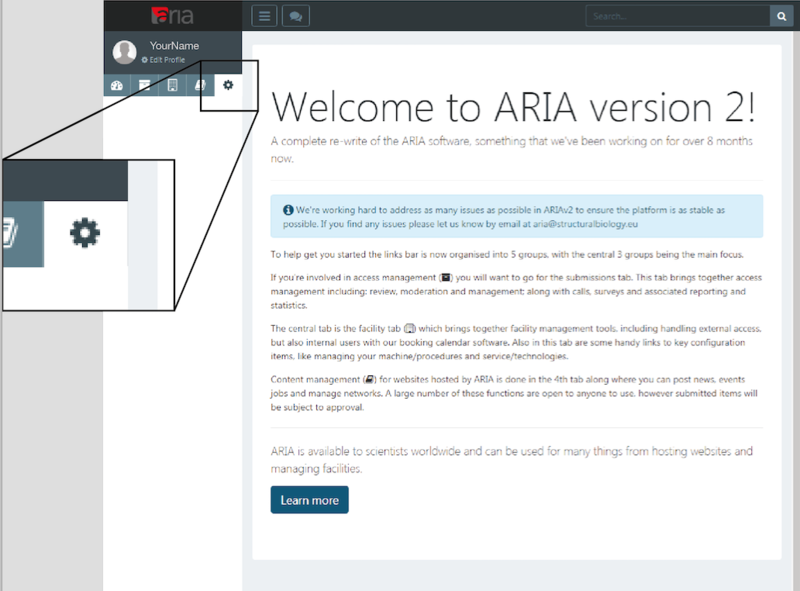 Add technical or administrative contacts for your machine/method from the list of ARIA users by typing in the box and clicking to select the desired ARIA user(s) to be machine/method contacts. Multiple contacts can be selected. Selected items appear dark teal coloured in the dropdown list, and appear as comma separated items in the text box. The following section of the machine/method form relates to access costing for the machine/method. Services provided through certain access routes (e.g. Instruct) are free to the access user at point of use but still need to be fully costed. Cost definitions are provided. Read the cost definitions carefully. In the "Definition:" text box describe a single unit of access and what equipment and support is required for a unit of access. Tip - convert currency to euros € using google form below https://finance.google.co.uk/finance/converter. In the "User Cost/day:" text box calculate and input the average user cost (in euros €) per day. In the "User Cost/day:" text box calculate and input the average access cost (in euros €) per day. In the "Facility Cost/day:" text box calculate and input the average access cost (in euros €) per day. Click "Add Item" to save the machine created, and add the machine/method to ARIA.